Price includes educational programming only. Additional cost for Saturday evening dinner or hotel accommodations. Registration is due by April 15th to guarantee meals. Hotel Reservations: A link to make your hotel reservation will be provided by LAIPLA. 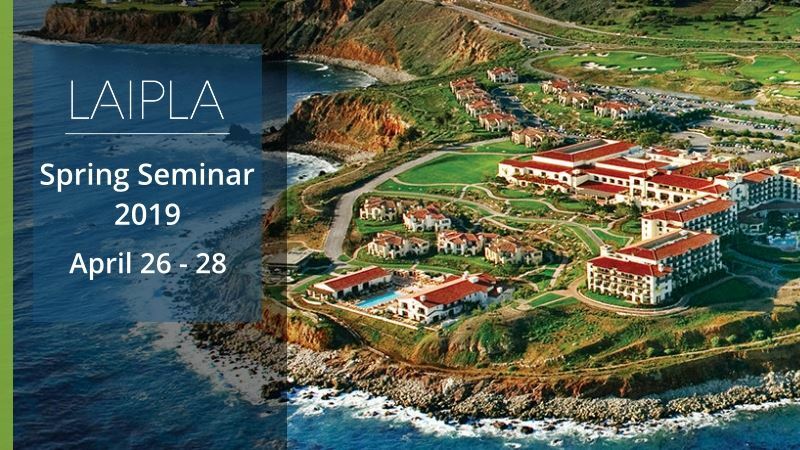 In order to receive the special discount hotel room rate of $325 per night, you must use the reservation link provided and make your hotel reservations directly with Terranea Resort. Please email your request for hotel reservation link to: office@laipla.net by no later than Friday, March 8th. LAIPLA Annual Golf Tournament - Enjoy the ocean view at every green on this beautiful 9-hole course. Can you putt, drive, or chip like a pro or just want to have fun with an afternoon of camaraderie? Our tournament scramble includes any level of player. Golf registration of $90 includes green fees, pull cart, contest prizes, water bottle, and a sleeve of balls. Sign up by April 15 to secure a spot in our tournament. Golf rentals are available for an additional cost. Cancellation Policy - By registering for this event you are guaranteeing your reservation. There are no cancellation refunds for this event. Registrations may only be transferred to someone at the Registrant's Firm or Company. All transfers must be made through the LAIPLA office at office@laipla.net.